In his spacious and tastefully decorated home at Karachi, Iqbal Jafar, retired from service with the government of Pakistan and column writing, views the developments of naya Pakistan on television with keen interest. His interest stems from his being part of the generation which witnessed the creation of the country, when in actuality, it was naya. Now in his mid-eighties, Jafar reminisces with both pain and pride his journey to Pakistan as a teenager. To reach this world, Iqbal Jafar’s family had crossed many a perilous paths and sacrificed a lot more. Jafar’s father had been an officer at the British Army General Headquarters (GHQ) and had opted for Pakistan when given a choice – but he had not opted for the way they were made to migrate. One wintry evening when he returned from work at Delhi, he was greeted with the kirpans of Sikh residents, signalling an immediate evacuation. Leaving all possessions, a comfortable life and blood relatives, Iqbal Jafar and his family had to migrate for a new home. Abdul Munim Khan, also in his mid-eighties, has a similar tale to tell. He, along with his sister, was sent with their uncle, also serving in the British Army GHQ, on a train from Delhi to Lahore. He had to wait for about a month before the rest of his family could join him. Before that, having not even reached teenage, he would rush to each train coming from India and look through the butchered carcasses to check if his mother and younger sister were among them! So appalled he has been from the experience, that to this day, he refuses to comment on it in person. Khan and Jafar share many similarities. Both, of roughly the same age, hailed from Delhi and settled in Rawalpindi. Both had nothing when they arrived at Pakistan, and had everything, from material comfort to centuries old roots in India: Abdul Munim Khan’s father was an affluent land owner while Iqbal Jafar’s father, apart from being an army officer, also possessed some land. Jafar almost lost one of his sisters on his way to Pakistan, while Khan’s father died two weeks after they had reached the new homeland. Both, after having completed their studies, went on to achieve great heights in their careers, with Iqbal Jafar becoming a successful bureaucrat, chief executive and columnist, and Abdul Munim Khan enjoying the rare honour of receiving two out of three cadet awards before joining the Pakistan Air Force and later Pakistan International Airlines as a flight captain. Both have yet another trait in common. Having lost all in the country of birth, Khan and Jafar share a selfless love for the country to which they migrated as refugees, in which they had to struggle, first for survival and later for success. They are both anxious to see Pakistan free of trouble and on the path to progress, as they know the worth of the blood which seeped in this soil, before it came to be known as the Land of Pure. In a recently published book, Remnants of a Separation, Indian author Aanchal Malhotra discusses the horrors and tribulations suffered by refugees on both sides of the partitioned subcontinent through their material memory. She visits and interviews families in India and Pakistan and traces their roots through an object each had managed to bring along. That object was not necessarily of material wealth: some had ancestral value, others had occupational value or simply, a plaque in front of the house was plucked out and brought to support a sentimental value. And while each bearer clutches his or her precious memory of their birthplace, the regard and passion they have for their homeland after partition is unmistakable. ‘It was not money or material prosperity that brought me here to Pakistan but inspiration. I was inspired by the idea of this land and aspired to become something for it,’ one gentleman speaks to the author with a youthful zeal uncharacteristic of his age. How do we compare these emotions with the ones the present generation has? Anger, mistrust, prejudice, intolerance, to name a few. Seeking ‘revengeful escape in crime and defiance, and release and redemption on alien soils’. We are quick to make comparisons and point out lacking in our country. We are eager to hoard wealth and secure our future while lament that of the nation as a whole. We deem ourselves foresighted to equip our offspring with ‘modern’ education, to ease their passage anywhere across the world. We are willing to migrate to greener pastures, forgetting that a migration made earlier, not in the hope of any material gain, enabled us to possess an identification which we are ready to relinquish without giving a second thought. We do not introspect to solve our issues. We pin hopes on one leader and decry when he is declared ‘unfit’ and search for another. The moment a leader dons the Jinnah cap, he himself and his supporters believe that the vision of Quaid – after whom the cap has been named – has translated in his soul. The time when the cap rests until the next momentous occasion, Quaid’s vision disappears and perceptions of self take precedence. 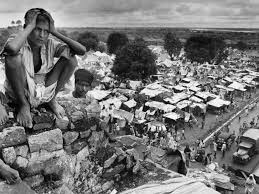 If each one of us attempts to relive the memory of an experience which a Pakistani in 1947 went through, we may understand what it means to be a Pakistani. We may then take matters in our hands and comprehend the principles of Unity, Faith and Discipline. We have to make a journey into Pakistan to realise how precious our homeland is. Iqbal Jafar and Abdul Munim Khan, like many others who witnessed the partition, at first claim to have no memory of the divide. The truth is that memory is etched forever in their hearts. They attempted to drown it in the blood and sweat they gave to this land. But it is this very memory, which we need to keep alive, in order to bring forth their legacy, generation after generation. Excerpts from: Let Us Agree to Survive by Iqbal Jafar, Dawn, August 14, 1991.